Gulf Air, the Kingdom of Bahrain’s national carrier, recently organized a familiarization trip to Moscow for key Dubai-based travel agencies in recognition of their longstanding support and ongoing mutual cooperation. 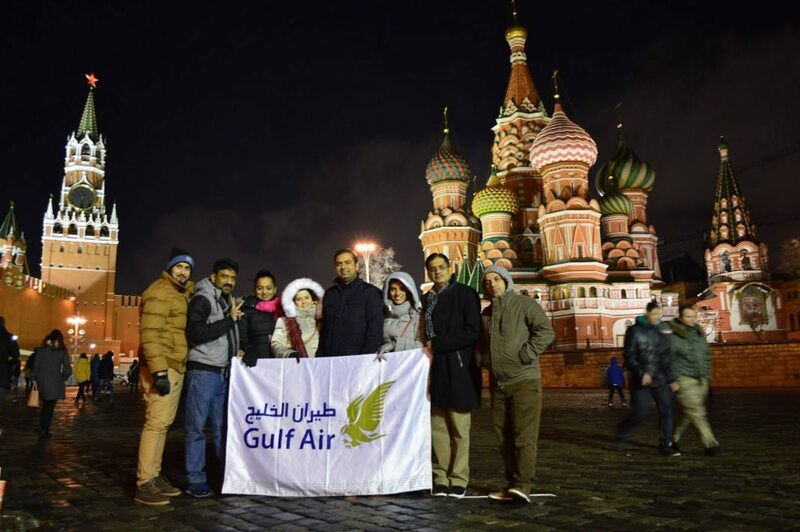 During the three day visit, the participating agents, accompanied by Gulf Air representatives, enjoyed tailored itineraries that allowed them to experience Gulf Air’s renowned onboard product and service offering, including the airline’s luxurious Falcon Gold Lounge in Bahrain International Airport, and visit some of Moscow’s most iconic attractions including Saint Basil’s Cathedral, Moscow Kremlin and the Red Square. Gulf Air connects Dubai to Moscow with 04 weekly flights affording seamless connectivity via Bahrain International Airport. The airline currently boasts a network that serves 45 cities in 24 countries spanning three continents. Flights to/from Dubai can be booked online at gulfair.com or by calling the airline’s 24 hour Worldwide Contact Centre on (+973) 17373737, or through any Gulf Air sales office and approved travel agencies. Gulf Air, the national carrier of the Kingdom of Bahrain, commenced operations in 1950, becoming one of the first commercial airlines established in the Middle East. Today, Gulf Air is a major international carrier serving 45 cities in 24 countries spanning three continents. The airline operates one of the largest networks in the Middle East, with double daily flights or more to 10 regional cities, in addition to select destinations in the Indian Subcontinent and Europe, from its hub at Bahrain International Airport. Gulf Air serves all its destinations with a combination wide and narrow body fleet totalling 28 modern aircraft. Renowned for its traditional Arabian hospitality, evidenced by the airline’s signature family and business friendly products, Gulf Air is committed to being an industry leader and developing products and services that reflect the evolving needs and aspirations of its passengers. Gulf Air connects Bahrain to the world and, as such, is a key national infrastructure asset, serving as a powerful driver for the economy and supporting the Kingdom’s on-going economic growth. Gulf Air was the Title Sponsor of the 2015 FORMULA 1 GULF AIR BAHRAIN GRAND PRIX and the Official Airline of the Bahrain International Airshow 2016.